Kevin Schwantz, racing Suzukis and more GSX-Rs than you’ll have ever seen gathered in one place before, it’s all on offer at Brands Hatch this Friday. But if you can’t make it in person, you won’t miss out. We’ll be there in force to bring you regular updates throughout the day. And even if you are going, it’ll be worth checking this site before you leave for weather and traffic checks, and when you get home, for pictures and reports from the day itself. We’re also hoping to host a live chat with Kevin Schwantz some time this week, so keep checking back for more information. 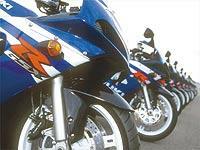 An army of 10,000 bikes bearing the famous four letters is expected to head for the GSX-R Festival. The circuit will be open for parade laps by GSX-R riders but register early as there won’t be enough time for everyone to have a go and it will be first come, first served. Once you’ve got over the experience of riding on that hallowed Tarmac, you can check out Suzuki’s " Family Tree " exhibition. There have been more than 100 combinations of GSX-R models and colourschemes over the years and Suzuki has gathered them all together for this event, from the GSX-R50, to the GSX-R1100. If such a comprehensive display of pristine, standard machines doesn’t float your boat, take a look at the Concourse show, where things get more extreme with turbos, nitrous, carbon-fibre and titanium. Even less sensible is the stunt contest, where amateurs will be trying to impress the judge, European stunt champion Kevin Carmichael, who’ll perform his own breathtaking routine on his GSX-R1000. Carmichael isn’t the only famous face you’ll spot. John Crawford will be there on his works British Superbike, along with John Crockford on his Superstock GSX-R1000 and Karl Harris on his Supersport 600. Former world rally champion Colin McRae who rides a GSX-R1000 to get his kicks will also be let loose on Crawford’s GSX-R750. And, of course, there’s Schwantz.. The 1993 GP champion, who runs a fleet of GSX-R600s at his U.S. race school, said: " I’d like to go around the track for a few laps and I hear there’s a couple of BSB GSX-R superbikes there… "
Entrance costs £10 and the gates open at 9am. Events run until 5pm. Under-16s get in free.